APH started record production of spoken word “talking books” in 1936. Audio books back then came on black vinyl 33 1/3 rpm phonograph records. The process was fascinating, labor-intensive, and pretty dirty. This “stamper”—of which we have quite a few—is an example of just how dirty it could get. After the acetate or “wax” disk was cut on a machine called a recording lathe, the disk was dipped into a nasty brew in our metal plating shop and zapped with electricity. A thin coat of nickel silver gradually built up on the outside. 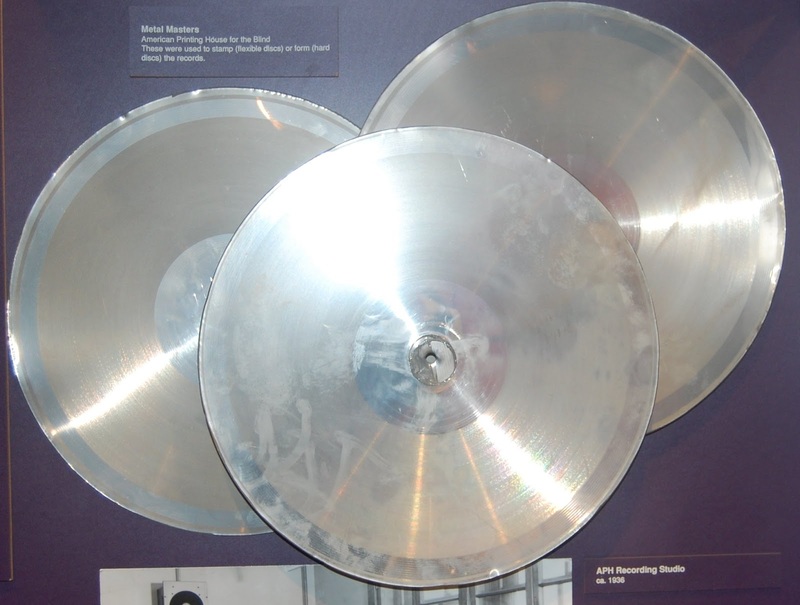 The acetate was peeled away from the resulting stamper and recycled, and the metal stamper was washed thoroughly to get rid of the chemicals. You made two stampers for each phonograph record, one for side A and one for side B. 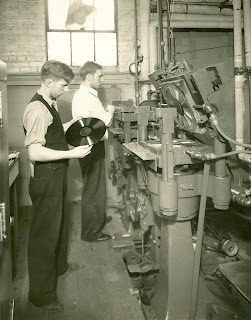 The photograph from 1936 shows the stampers in the jaws of one of our original record presses. Our last rigid vinyl disc was pressed on May 8, 1987 for a recording of “Those Days," a 1986 family memoir by Richard Critchfield.